There are many different ways to acquire Web conferencing software for your business. You could, for instance, use the services of an IP PBX, i.e., a public branch exchange with Internet Protocol capabilities. In doing so, you would gain access to Web conferencing in addition to a variety of other communications features commonly referred to as unified communications. The downside to using an IP PBX for video conferencing, however, is that you will receive conferencing as an add-on feature rather than as a premium service and so you will, most likely, get fewer features and less stringent data protection. Another option is to download a “freemium” service from the Web. This type of service provides free conferencing at no charge to your business. Be careful when selecting a free conferencing provider, however, as many businesses that offer free solutions support a nefarious practice called “traffic pumping.” This disreputable practice involves routing large amounts of traffic through local network providers in exchange for financial kickbacks generated from access charges paid for by long-distance carriers. It’s not easy to determine whether a company is involved in this type of practice, either. The best way to obtain affordable—and reliable—Web conferencing software is to invest in the services of a premium Web conferencing provider like Onstream Meetings. 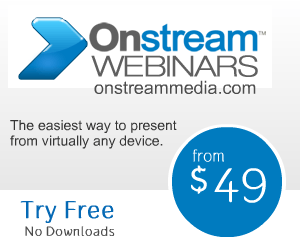 Using Onstream Meetings, you will gain access to over 100 features that you can use to enhance your conferences. Further, you will gain the robust services of an easily accessible customer support team.